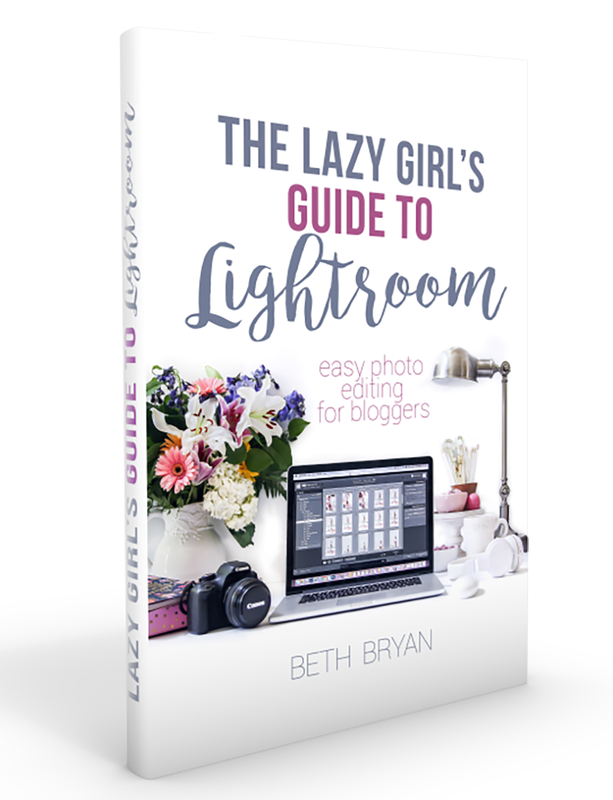 With just three weeks to go before I have to teach a class at the Haven Conference in Atlanta and take a million selfies with 400 DIY bloggers, I’m desperate to shed some of my non-budging baby weight. So, I started a 90 Day Low Carb Challenge with a bunch of my best girlfriends. (Nothing like waiting until 20 days before an event to start the 90 Day Challenge.) One of my friends has recently lost a lot of weight following the ketogenic diet plan, so she has inspired all of use to give it a try. So, let’s do this. My low-carb/ keto-friendly dinner tonight turned out SO good that I had to share it with y’all real quick. It was probably one of the top ten best meals I’ve ever cooked. These Flank Steak Roll-ups were AMAZING. Sorry for the bad lighting cell phone photo, but these got inhaled before there was any time to take a pretty staged photo. 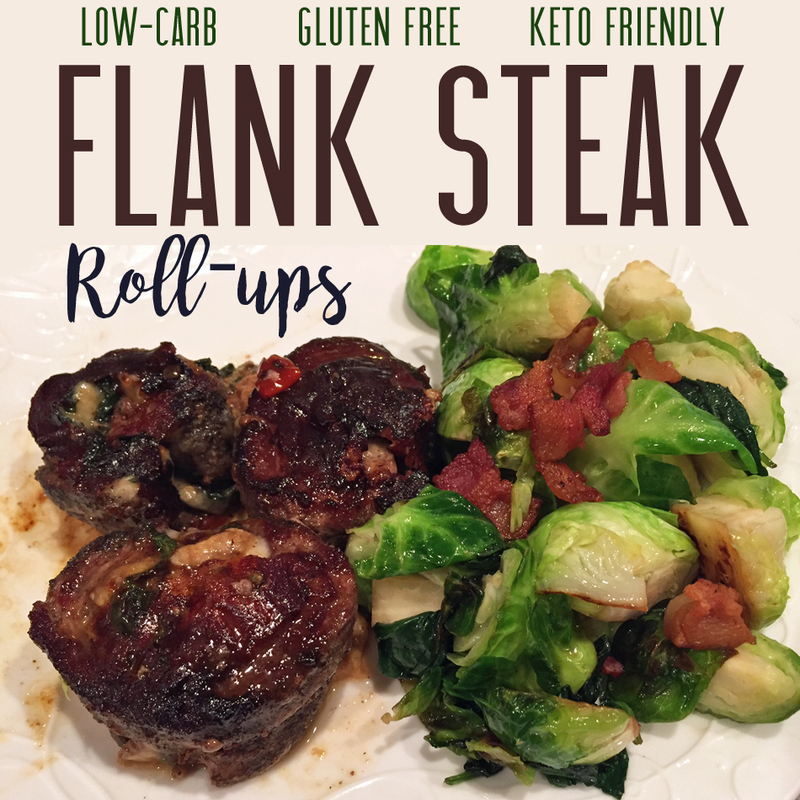 These Flank Steak Roll-ups were AMAZING. Sorry for the bad lighting cell phone photo, but these got inhaled before there was any time to take a pretty staged photo. You’ll also need some kind of spices to rub on the outside of steak- I used Southern Flavor Charbroil Seasoning but I know it’s made locally and hard to find. Pound flank steak to 1/4″ thickness in a rectangular shape. Sprinkle salt/ pepper on meat. Cook bell pepper and garlic in a small amount of olive oil over medium heat until tender. Spread the sauteed garlic and red bell pepper evenly over the flank steak. Add provolone cheese slices evenly over steak in a single layer. Add a big ol handful of baby spinach on top of cheese. Roll the entire flank steak into a pinwheel, keeping the cheese and spinach tightly in the middle as you roll. Rub the outside of the entire steak with Charbroil seasoning, rib rub, spice rub or something similar- whatever you have in your pantry will work but at the very least use salt/ pepper. Cut meat into 2″ pinwheels, using toothpicks to keep the pinwheel shape. Saute pinwheels over med-high heat in about 1 Tbsp olive oil until meat is cooked through and cheese is gooey. Turn over halfway through cooking to brown evenly on both sides. 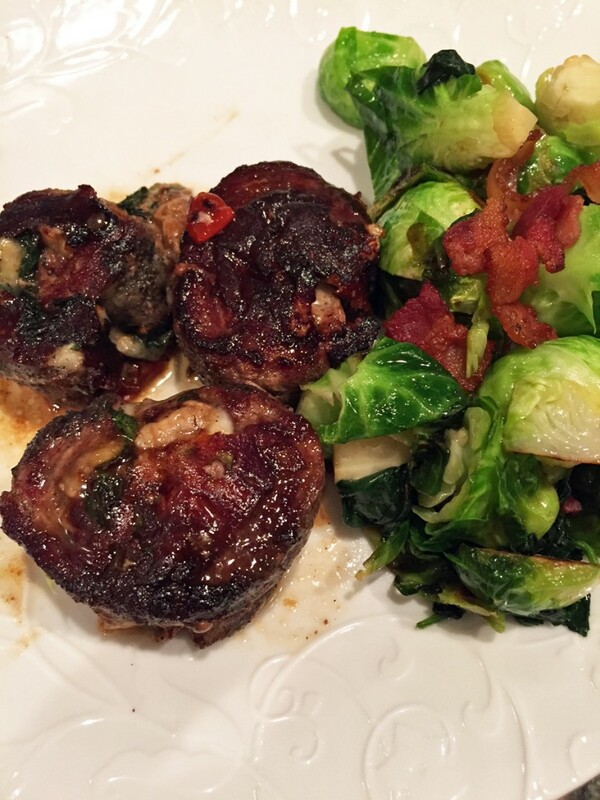 I served these with a side of brussel sprouts sauteed in bacon, and it was like a meal from a 5-star restaurant. YUM. « Today is July’s Black Friday! Sounds delicious. I must try these to help with my weight loss. Thanks for sharing. Thanks for sharing. I really need to lose weight. I just started a exercise program 3 days a week at 6 am. at Planet Fitness. It is hard. LOL. Anyway I’ve been thinking of going on a low carb diet. My friend has had lots of success with that kind of diet. Best of luck to you sister! i love any recipe with cheese and i want to try your recipe.I have been researching on cheece graters since we make them,which kitchen appliances did you use to process your food? Like what you see? Get the latest updates!